Spinal cord injuries impact more than 17,000 Americans each year, and although those with incomplete injuries may regain control of their limbs, overall muscle strength and mobility is weakened. Neurorehabilitation using robotic exoskeletons or electrical stimulation devices can help a person regain movement through repeated exercise. The amount of assistance through these devices during neurorehabilitation is based on the measurement of the user's remaining muscle function. However, current sensing techniques are often unable to correctly measure voluntary muscle function in these individuals. Any discrepancies in the measurement can cause the robot to provide inadequate assistance or over-assistance. Improper robotic assistance slows recovery from the injury, and can potentially lead to falls during robot-assisted walking. To reduce this risk and provide therapists and patients with a more efficient rehabilitation tool, a researcher at the University of Pittsburgh's Swanson School of Engineering is utilizing ultrasound imaging to develop a more precise interface between exoskeletons and individual muscles. Nitin Sharma, assistant professor of mechanical engineering and materials science, received a $509,060 CAREER award from the National Science Foundation for "Ultrasound-based Intent Modeling and Control Framework for Neurorehabilitation and Educating Children with Disabilities and High School Students." The NSF CAREER award is the organization's most competitive research prize for junior faculty. Current noninvasive rehabilitation devices measure electrical signals from muscle activity, also known as electromyography to predict remaining muscle function and subsequent assistance. However, Dr. Sharma explained that correctly measuring how much assistance the device should provide is a challenge with electromyography, and also its use is limited to large muscle groups. Dr. Sharma says, "In very complex muscle groups that provide a range of motions, we need to measure individual muscle activity, rather than measuring the entire muscle group at once via electromyography, because it is susceptible to interference from adjacent muscles. Ultrasound can reduce the interference from surrounding muscle groups so that we can collect, monitor and control muscle activity of individual muscle fibers." Dr. Sharma's lab group will specifically focus on the human ankle for both its range of complex movements and its role in providing stability and balance when walking or standing. Ultrasound will provide precise imaging of the ankle muscles responsible for specific movements, which in turn will allow for optimization of electrode placement and correct modulation of robotic assistance to initiate movement. Ultimately, Dr. Sharma intends to build an ankle exoskeleton that patients and therapists can use in clinical rehabilitation. 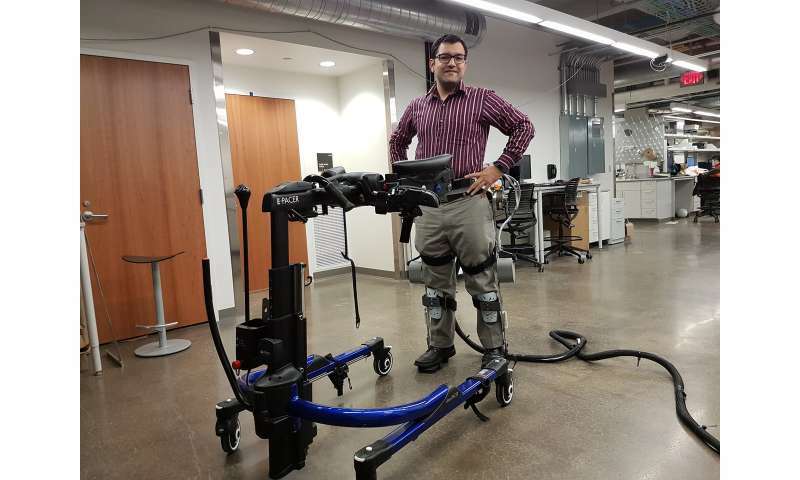 "Rather than randomly stimulating the entire ankle area to create movement in one direction, a wearable ultrasound-based exoskeleton can better monitor and control movement so that persons with incomplete spinal cord injury can more safely and quickly walk on the road to recovery," Dr. Sharma said. "The technology also has the potential to help patients with other walking disorders better control their gait and balance."